The stoves of yesterday lacked the fuel efficiency and clean-burning design of modern designs, which makes the decision even more important. You’ll want to consider the layout of your house — how many square feet you need to heat — and what kind of look you want. Aesthetics aren’t the only factor, but they’re an important one. You also need to consider your budget when trying to find the best stove for your situation. The price between any one of the options will differ depending on the size of the space you need to heat, and its fuel source. Outside of looks and budget, it’s essential to do your research. Specifically, you will have to look at fuel costs, energy efficiency, heating potential, upkeep/maintenance, and overall cost (includes stove and installation). Wood pellets are environmentally friendly and carbon neutral. This means they don’t contribute to greenhouse gas emissions and can ultimately be disposed of in landfills. The pellets are typically made from compressed sawdust. 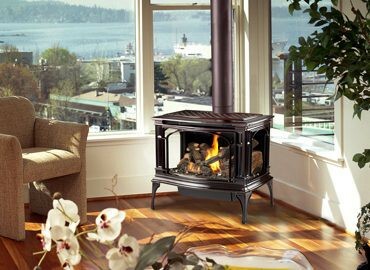 A 30,000 BTUs/hour pellet stove can provide heat for a house up to 1,800 square feet. Most models feature 100% combustion, further improving their rate of heat and environmental soundness. Wood pellet stoves generate more heat compared to similarly sized gas fireplaces, and are better suited for heating an entire home, or a larger portion of it, than just a single room. Older wood stoves aren’t as energy efficient as today’s newer models, so upgrading is necessary if you’re serious about heating your home with wood. It’s important to ensure that the new model is also EPA certified. Newer wood stoves often use 1/3 less wood for the same amount of heat, and they cut creosote build-up, which reduces the risk of chimney fires. They’re also up to 50% more energy efficient than older models. Many contemporary wood stoves have been designed to reduce indoor and outdoor wood smoke pollution, including carbon dioxide, methane, and particle pollution. Wood stoves provide less overall heat than other stoves, making it less than ideal as a primary heating source. An EPA-certified wood fireplace insert may fare better for heating than a freestanding wood stove for your home. Gas is a clean-burning alternative that emits less smoke and pollution. It won’t aggravate respiratory problems thanks to the lack of particulates and smoke. Gas stoves run on natural gas or propane and heat at a range of 8,500 to 100,000 BTUs depending on the model. Some of the more popular stove models are between 20,000 and 60,000 BTUs. Although gas may be clean burning, it’s a fossil fuel and is thus non-renewable, making it far less eco-friendly than the other fuel alternatives. Cord wood can be locally sourced, thus reducing your fuel expenses; but when you have to purchase wood, you can expect to pay more depending on your location and the time of the year. On average, a 40 lb. bag of wood pellets will cost you about $4 — $10. They also require electricity to run; however, their cost per month in terms of electricity is minimal, averaging $9/month according to the Department of Energy. Operational costs for gas stoves fluctuate based on gas prices, from $0.10 — $0.50 per hour of use. Following the manufacturer’s recommendations goes a long way to making the maintenance of your pellet stove a breeze. Most of the checks can be performed by owners, like inspecting the motors and fans, and removing any debris. Servicing any of the motors or electronic circuit board requires a specialized technician, which can be costly. Otherwise, day-to-day and even year-to-year maintenance for pellet stoves is practically effortless. If you’re locally sourcing wood, it means you’re splitting, stacking, and hauling it somewhere; and if you have to buy it, it cancels out the cost-efficiency of a wood stove. These stoves also require regular tending, at least twice a day. It’s difficult to regulate the heat output as well. Yearly chimney cleanings and inspection of the system is required to remove residue and soot. The biggest aspect of maintaining a wood stove is inspecting the catalytic combustor, which is usually done at least three times each season. Gas stoves are easy to operate, with many featuring an on/off button or a remote control. They don’t require lighting or tending to, and there’s no ash to clean up. These stoves react instantaneously and begin working as soon as they’re turned on. Their maintenance needs are also few. An annual inspect is about all you’d need, which costs between $75 — $150. These cost between $1,700 and $3,000 before installation fees. With installation and everything else you’d need, the total ranges from $3,500 — $4,000. They don’t require a chimney so you’ll save on chimney and installation costs compared to wood stoves. A wood stove will run you anywhere from $3,000 — $4,200, which includes hiring a professional installer. Higher end models with all the accompanying extra attachments could get as pricey as $5,000. If you have an existing fireplace and chimney, you might save money on installation with a fireplace insert. If not, the installation of a ventilation system will be costly. For a gas fireplace insert, the cost is around $3,000 — $4,000. A freestanding gas stove usually costs $4,000 — $5,000. They tend to be the most expensive when considering total upfront costs, and operating costs. Overall, your choice should be dictated by what you need the most. Are you looking for something you can turn on and off to keep you warm while you’re taking morning coffee in the kitchen? Do you need a stove that will heat your entire house during the coldest parts of the year? There is no blanket answer for the best type of stove, although some are better than others are when it comes to certain aspects, such as fuel efficiency and aesthetics. When you’re browsing for the best stove, talk to the manufacturer to see what they think would work best for your needs, and always consult the experts when it comes to questions on proper installation of a freestanding stove for your home. Originally published at www.lanchestergh.com on November 1, 2016.